The succession planning process identifies the next generation of leaders in your company who will eventually fill critical positions once the current employees move up or move on. Often, the individuals you nominate as successors are not yet ready to fill a key role, and require time to develop the required skills, knowledge, and experience to advance to a leadership position. 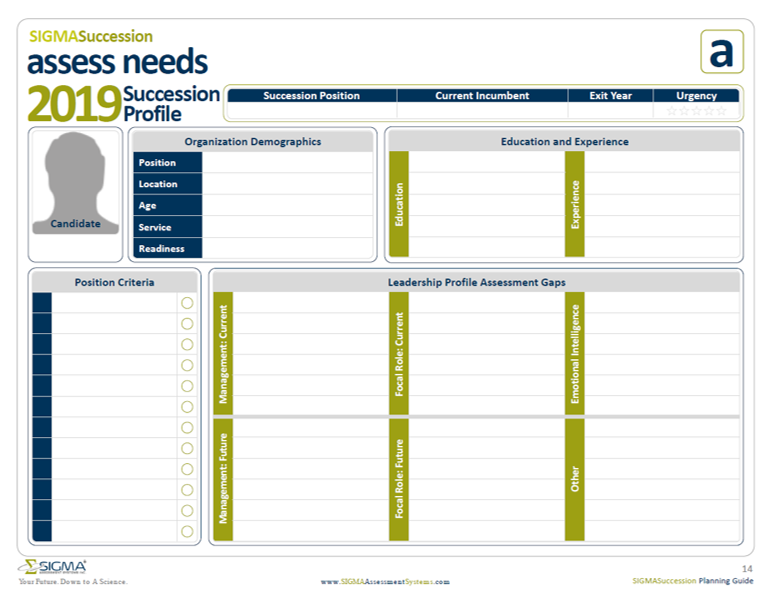 After your succession planning team has identified the critical roles to include in your succession plan, built success profiles, nominated succession candidates to fill critical roles, and built a succession bench of future leaders, your next step is to assess candidates’ development needs. This means you’ll look closely at each candidate and determine what areas they need to develop in order to gain new skills, become more ready, and eventually take on the new role. One of the simplest and most accurate ways to determine an employee’s development needs is to use various types of validated assessments, such as personality-based and 360-degree feedback assessments. By comparing assessment results with the Success Profiles for critical roles you developed earlier, you’ll expose any talent gaps and better understand how the employee needs to develop themselves to get ready for their future role. These are just a few of the types of assessments we provide. Using validated assessments adds objectivity, credibility, and transparency to your succession process. It also helps generate buy-in from senior leadership, candidates for succession, and other relevant stakeholders. As part of SIGMA’s Simple Succession Process, we offer interpretation of results, report debriefing, and one-on-one coaching with your succession candidates. Always include an objective measurement as part of your process. Determine what is important for success first, then select the right tool to measure it. Ensure the tool is evidence-based and shows validity for selection purposes. Use assessments that all stakeholders find relevant. Your succession planning team can use the data from the assessments to complete individual Succession Profiles that highlight and monitor the gaps between where candidates are now and where they need to be to move into their future role. The Succession Profile combines details about the success criteria for the position with the candidate’s education, experience, and current readiness for the role, as well as their development gaps uncovered through the assessments. Use the Succession Profile to prepare a development plan to close these gaps over time. Be sure to review, challenge, and adjust the profile at least once a year, and whenever there is any change in the role or its success criteria. Discuss the Succession Profile with the candidate and their leader at least annually as well. By making this review a priority, you will give your succession plan the visibility it needs, and demonstrate the company’s commitment to each individual’s development not just with words, but with concrete action. As a candidate works through the development plan, they should progress through the readiness levels toward Level A—ready to take on the role today. Be sure to update your Succession Bench overview document when a candidate’s readiness level has changed, to keep that document current, and to help measure and monitor the success of your development program overall. Now that you have identified the development needs of your succession candidates, it’s time to take action. The next step in your succession process is to develop the talent in your succession pipeline. We’ll discuss how to prepare and execute development plans in our next succession planning article.